Cards are a great way to let people know that you are thinking of them. Sure you can buy a card, but bonus points if you create one yourself! Making a card does not have to be complicated or take a long time. Pretty papers are my favorite! They are the first thing I look at when a new Stampin’ Up! catalog comes out and there are always a couple packs of new pretty papers on my first order. 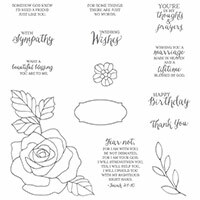 They are an inexpensive way to make a whole bunch of cards in a short amount of time. Today’s Quick & Easy Cards were made with the new Delightful Daisy paper. I’m lovin’ it! It’s also inexpensive to pair new pretty papers with greeting stamps you already have. This “You’re in my thoughts & prayers” stamp comes from one of my favorite stamp sets – Rose Wonder. This stamp set also has a couple of flower stamps in it but I don’t think I’ve ever used them! I’m all about the greetings in this set because as you can see they work with just about everything. Change the shape. One easy way to change the look of a card is to change the shape that your greeting is on. These two cards have the same basic layout with one difference – a square vs a circle. I used Big Shot dies to cut these out but you could use your papercutter, shaped punches or even just scissors to cut your own shape. Change the color. Another way to change the look of a card is to change the colors. Here I used 2 different colors for the card bases. The color of the card base brings out different colors in the pretty paper. Neat, huh? Try It! Grab a piece of pretty paper and make a card using this card layout. I’ve given you all the paper sizes above so it will be easy for you to cut the pieces out. Most importantly, once you’ve made the card… send it to a friend! 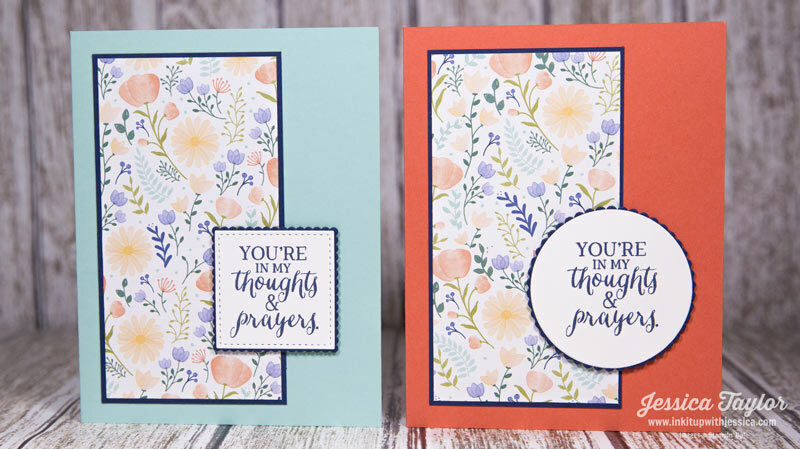 Want to learn more about making cards using the supplies you already have?